WILMER - A bus carrying elderly Bellaire evacuees from Hurricane Rita caught fire this morning on a gridlocked highway near Dallas, killing 24 people, authorities said. The bus, carrying about 45 people from a Bellaire assisted living center who had been traveling since Thursday, was engulfed in flames, causing a 17-mile backup on Interstate 45 that was already congested with evacuees from the Gulf Coast. 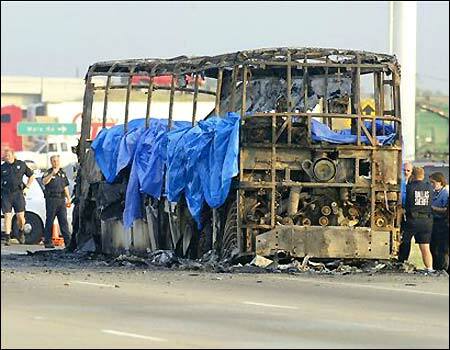 The bus was reduced to a blackened, burned-out shell, surrounded by numerous police cars and ambulances. There were indications that oxygen used by elderly evacuees could have had a role in the fire, Peritz said. There were a series of explosions, apparently from the oxygen equipment, he said. "The early indications are this is a mechanical issue. The driver did survive the accident," Peritz said. "It's my understanding he went back on the bus several times to try to evacuate people." Interstate 45 stretches more than 250 miles from Galveston through Houston to Dallas. The crash site is roughly 17 miles southeast of downtown Dallas near Ennis. Gov. Rick Perry spokeswoman Kathy Walt said traffic on I-45 would be diverted at Ennis, about 30 miles southeast of Dallas. Drivers could take State Highway 287 west to Interstate 35E, or State Highway 34 east to Interstate 20. She said it was unclear how far the gridlock extended.